The Mixed Marvel Arts Podcast welcomes two new guest hosts to the podcast! When Shaun is unable to join the monthly recording, Brian looks to the remaining Fantasy Comic League members for help. 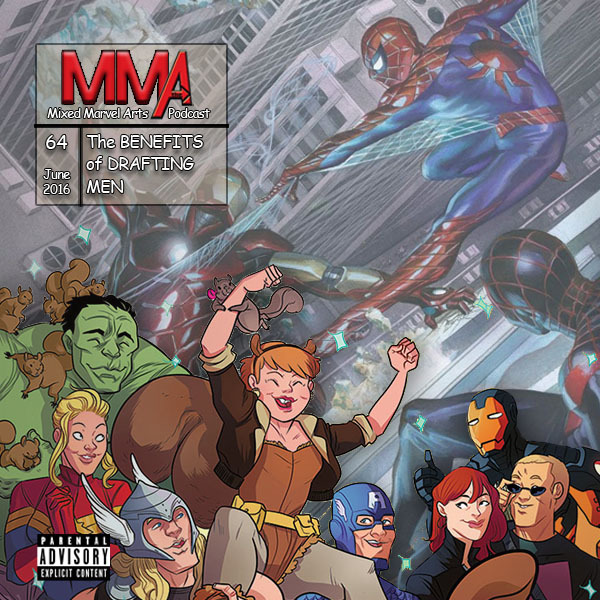 Matt and Jorge heed the MMA call and join Brian to discuss how their fantasy teams benefited from Spider-Man and Iron Man, respectively. Brian and Matt discuss the recently announced Spider-Man Playstation game as well as Matt’s love for the Marvel fringe characters, such as the Unbeatable Squirrel Girl. Brian and Jorge bond over their Northern Virginian upbringings and respect for the Summers family tree. Episode artwork: Amazing Spider-Man, vol 4 #13 by Alex Ross; Unbeatable Squirrel Girl, vol 1 #1 by Erica Henderson and Rico Renzi.